1979 - The Jacksons perform Destiny tour in St. Louis[US]. 1984 - The Jacksons perform Victory tour at Municipal Stadium in Cleveland, Ohio [USA] attending 44,000. 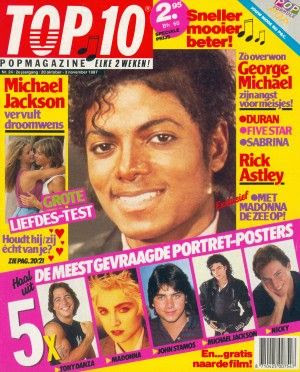 1987 - Top 10 magazine [Netherland] featured Michael on their cover. 1996 - Michael performs HIStory concert at Chungcheng Stadium in Kaohsiung, Taiwan attending 30,000. 2000 - The Jackson 5 inducted into the Vocal Group Hall Of Fame at the 2nd annual induction ceremony. The class of 1999 was honored along with the class of 2000, during the two day ceremony, which will be held in Sharon, Pennsylvania. There was a dinner, a golf tournament and a concert which feature some of the famous groups to be inducted. Here is a complete list of the class of 1999 inductees--the Ink Spots, Revelers, Modernaires, Coasters, Delta Rhythm Boys, Little Anthony & the Imperials, Hank Ballard & the Midnighters, the Moonglows, the Four Tops, the Temptations, the Four Seasons, the Spinners, Peter, Paul and Mary, and The Jackson Five. 2005 - Michael has once again been summoned to appear in court – but this time as a juror. Thomas Mesereau informs that Michael won’t be be able to attend because he’s seeking permanent resident in Bahrain. This entry was posted on 20 October 2010 at Wednesday, October 20, 2010 and is filed under 1979, 1984, 1987, 1996, 2000, 2005 . You can follow any responses to this entry through the comments feed .